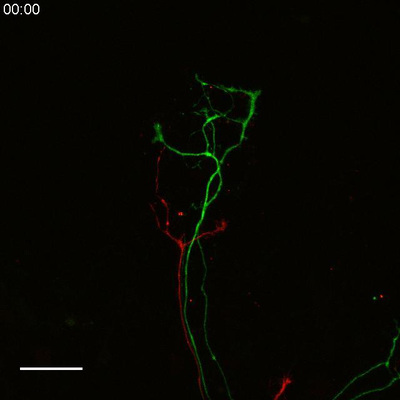 How do spiral ganglion neurons acquire their unique properties? To define the networks of genes that promote auditory-specific aspects of development, we performed a microarray comparison of spiral ganglion neurons and the closely related vestibular ganglion neurons. 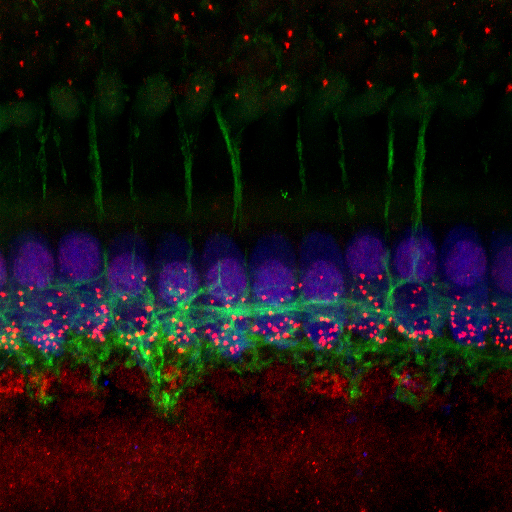 Based on those findings, we are now analyzing mutant mice that lack auditory-specific genes, such as the transcription factor GATA3, which appears to serve as a master regulator of the entire circuit assembly process. Current efforts are now focused on transcription factors downstream that appear to regulate synapse formation and SGN firing properties. Experiments include analysis of the cellular phenotype, in vitro explant assays, microarray and ChiP-Seq studies, as well as auditory brainstem response recordings to detect functional deficits. 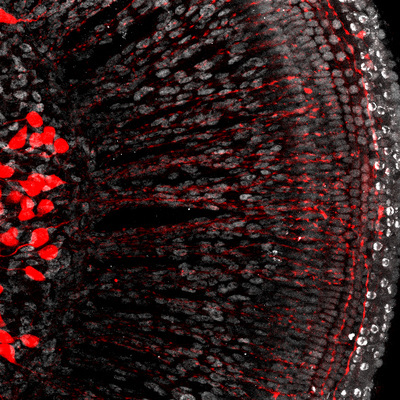 Developing SGNs must navigate an incredibly complex environment in order to reach and innervate the organ of Corti, as the cochlea houses a diverse group of cells including mesenchymal cells and glia and is growing during its innervation. Although precise interactions between these cell types are crucial to the wiring, patterning, and function of the cochlea, they remain poorly characterized, in part because their interactions are tied to the intricate 3D-architecture of the cochlea. 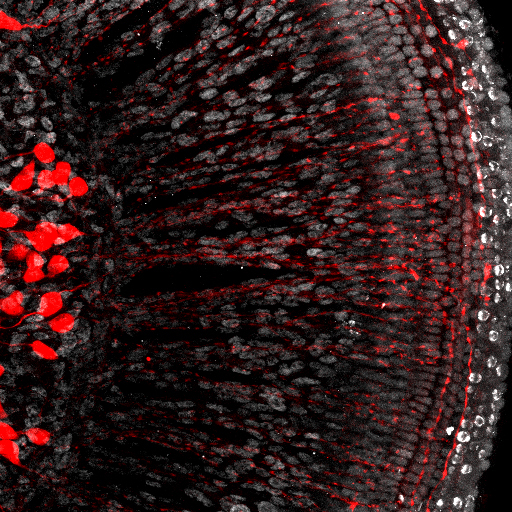 To overcome this challenge and to achieve a greater understanding of how the interaction between these cells sculpts auditory circuitry, our lab has developed a novel live imaging system to track developing SGNs within a suspended cochlea. We have successfully used this technique to examine neuron-glia interactions and SGN targeting, to name a few examples. ​Recent studies have shown that SGNs may be the primary cellular target for both age-related (AHL) and noise-induced hearing loss (NIHL). Loud noises cause rapid loss of SGN peripheral synapses and permanently damage SGN peripheral processes, inducing them to retract and undergo a long, slow process of degeneration which eventually leads to cell death. 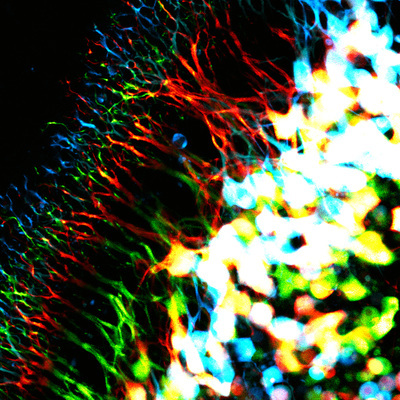 However, very little is known about how these sensory neurons preserve both their connectivity and survival throughout the lifetime of the organism. Using a combination of different mouse models and spiral ganglion explants, we are interested in investigating the excitotoxic cascade(s) that result in peripheral degeneration and pursuing protein candidates that might confer neuroprotection against such noise-induced damage.